"This was the best of all possible worlds. But even here, a little help was necessary. And that's where Troy came in. Troy supplied feel-good pills to all the kids at Hillside. And, in this way, happiness was spread all around. Life could not possibly be any more wonderful." Films exposing the seemingly hidden, dark underbelly of suburban life have been old hat since American Beauty came on the scene, and even then, the concept was far from fresh. The Chumscrubber, a glossy first effort from director Arie Posin, is the latest entry in a genre intent on revealing the discontent visible just beneath a surface of cookie-cutter homes, well-manicured lawns, and perfect nuclear families. It takes place in a world where all the kids are doped up on prescription "happy pills," and all the adults are emotionally numb, wrapped up in their own lives and unconcerned with the lives of their children. Troy (Joshua Janowicz) supplies the drugs to all the teens in the picturesque community of Hillside, and when he commits suicide, leaves a vacuum that threatens to upset its perfect balance. His best friend Dean (Jamie Bell) finds the body but can't let himself feel anything, and is equally aloof when bully Billy (Justin Chatwin) enlists his friends Crystal (Camilla Belle) and Lee (Lou Taylor Pucci) in a scheme to kidnap Dean's younger brother (Rory Culkin) and hold him until Dean delivers Troy's leftover stash of drugs�but then, why would he care, since the kids nabbed the wrong Charlie (Thomas Curtis)? The Hillside parents are unaware of the drama going on in their children's lives, not because they're all on drugs, but because the drive to create the image of the perfect life proves too much of a distraction. As Troy's mother (Glenn Close) mourns her son, her neighbor, and Charlie's mother, Terri (Rita Wilson) plans her wedding to the mayor (Ralph Fiennes), and doesn't even notice her son has been abducted (she spends an hour talking to his empty room through a closed door, assuming he is upset about the coming nuptials). Meanwhile, Dean's mother (Allison Janney) tries to be the ideal mom but finds more satisfaction peddling a vitamin "life system," and his father (William Fichtner), a Dr. Phil-esque self-help author, mines his son's tragedy for material for his next book. Crystal's mom (Carrie-Anne Moss) cares more about pretending to fit in with the teens than being a mother, and Lee's dad (Jason Isaacs) only cares about his son's grade point average. For a while, it's fascinating to watch these characters bump in to one another but never really connect as Posin and co-writer Zac Stanford pile on the quirks and absurd misunderstandings, but after a while, it all starts to feel like an empty stylistic exercise that thinks it's saying a lot more than it actually is. It's one of those films that strives for a dreamlike drugged quality, and while it succeeds on that count, there's nothing going on to justify sitting through all of the increasingly self-conscious, aggressively "indie" weirdness. Posin creates a candy-colored world that's pleasant enough to look at, but its artificiality becomes tiring after a while. He seems to be striving for the Donnie Darko crowd in both tone and message, but the cause and effect, everything-happens-for-a-reason story isn't as ambitious, nor as rewarding. It's a shame, because a lot of the movie is worth watching. The adult actors all give memorable performances, adding a bit of dimension to characters that are caricatures, and Jamie Bell is great as the disaffected youth finally reconnecting with his suppressed emotions. Camilla Belle isn't given much to do as Crystal, and Justin Chatwin hams it up as the villain of the piece, though the script does Billy's character no favors. This really goes off the rails during the third act, when the kidnapping threatens to turn bloody and the ham-handed symbols and metaphors pile on and threaten to turn the whole narrative into an overwrought mess. An emotional release between Bell and Glenn Close saves things somewhat, but for the most part, The Chumscrubber has little new to say and spends a long time saying it. 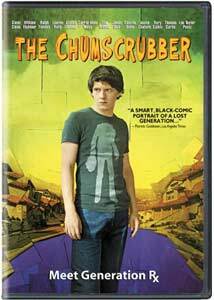 By the way, the Chumscrubber is, aside from the worst title for a movie, I think, ever, a fictional multi-media cartoon and videogame creation, an undead superhero that uses his own detached head as a weapon in his battle to rid suburbia of zombies, or something. On a symbolic level, his purpose in The Chumscrubber is unclear beyond the fact that he provides the title; I guess the intent is to imply a dark underbelly to the perfect surface of the community, but in practice, the device is annoying and intrusive, with Chumscrubber sequences glimpsed in garish CGI, and its voiceover reminiscent of Frank the Bunny in Donnie Darko. Image Transfer Review: This 2.35:1 image looks good, with candy-colored images and good detail. I didn't spot any edge enhancement or print defects, but this is some slightly distracting aliasing and digital artifacting visible in spots. Overall, a fairly typical transfer for a recent film, not that it's a bad thing. Audio Transfer Review: Though this is a drama, the DD 5.1 audio mix makes good use of all channels. The front soundstage is nice and wide, presenting dialogue clearly and expanding with the occasional sound effect and the score. Fantasy sequences set in the world of the Chumscrubber liven up and move into the surrounds, and the rear channels are also but to good use during a scene in which Jamie Bell's character hallucinates. Extras Review: A virtual no-show in theaters, The Chumscrubber is being released more or less direct-to-DVD with a few okay bonus features. Director Arie Posin and writer Zac Stanford provide an amiable, chatty commentary, complimenting their actors and discussing the script's symbols and deeper meaning and whatnot. They also proudly point out how references to the Chumscrubber cartoon are peppered throughout, like that's a good thing. The Making of The Chumscrubber (12m:09s) is a fluffy PR piece, with director Arie Posin praising his cast, and nearly every recognizable member of the cast praising Posin and the screenplay. There's not really any more substance than that. A reel of 10 deleted and extended scenes (14m:22s) offers more of the latter�most are existing sequences with an extra line or two of dialogue. The only actual deleted scene, of Billy giving Crystal a necklace, would have taken place early on, and several of the extended sequences were edited down to remove references to the gift. Though no trailer for the feature is provided, there are promo clips for Red Eye and Just Like Heaven. Ambitious, initially likable, but ultimately, aggravatingly uneven, The Chumscrubber is a near miss, a trippy, oddball successor to the throne of Donnie Darko that never really comes together or seems to have anything original to say. That said, it's well made, and features a good cast, and probably deserved to be given more of a chance in theaters rather than dumped unceremoniously onto DVD.